I needed to make an easily transportable house for the rats so that	we could take them away on holiday with us. It wasn’t too difficult finding a pet friendly holiday cottage that would be happy to take unusual animals. What was more difficult was designing a Pouched Rat house that would pack flat for ease of transit and be big enough and strong enough to house a pouched rat for a week. 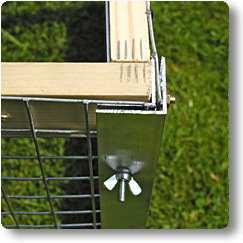 This guide describes the basic build details of what’s	been christened the ‘flat-pack rat flat’. The house, when assembled, is a bit smaller than the main house. The ground floor area is 900x600 mm and it is 600	mm tall. The house has an upper level which gives	an extra 900x300 mm of floor area. There's a	hole is the upper	level for the potty. The main frame is made from aluminium sections. 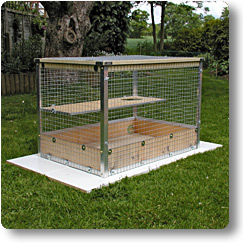 The sides are made of strong wire mesh with the bottom 150mm clad with ply to give some privacy, protection from drafts and to stop the rats throwing their bedding out of the house. The roof was originally	made from mesh and it has a wooden frame. The roof and side were later replaced with perspex which is light and prevents the rats falling when trying to climb up the walls and across the roof. The	floor	is made	of	a	single	sheet	of	ply. Each	side, the floor,	the	roof	and the	upper	level	are separate pieces	which	slot	together	and	are secured with 16	wing-nuts. All these materials, except the wire mesh, came from DIY superstores. Some	of	the	items are	only	stocked in one particular store	so	be prepared	to hunt	round all	the main DIY shops to get everything you need. The materials for this	house cost about �200. Avoid any materials intended for garden use. These may have been treated with anti-corrosion treatments such as zinc which are poisonous to animals. The only place I was able to buy the wire mesh was online. *Perspex can be used instead of the mesh. You will also need a range of fasteners and fixings: round headed screws,	bolts,	wing nuts. Specialist tools are not required however an electric drill, electric sander and heavy duty staple gun will make the job much quicker. Cutting the angles correctly is much easier with a proper mitre saw and G-clamps are useful for holding things in place while drilling holes for the bolts but these are not essential. Other than these tools you’ll only need a hammer, screwdriver, pliers, a wood saw and a hacksaw (for the aluminium) and a pair of wire	cutters or tin-snips to cut the mesh. The main structural elements of the travel house are the corner posts which are part of the two shorter sides. These are	made	of	two	L shaped aluminium sections bolted one	inside	the	other. The inner section is a bit smaller that the outer section and when bolted together, with a 3mm space in between, their edges are flush. The space makes a slot into which the mesh/perspex of the long sides are	inserted. The slot is clamped shut on to the mesh by	tightening up	two wing-nuts	and bolts which go through the aluminium sections. Each side is constructed in a similar way except for the four posts which are bolted permanently to the short sides. As it is the four corner posts which provide the rigidity and structure the sides themselves are simply sections of wire mesh to which the following items are bolted, screwed or stapled. Very large washers are used	with the bolts to secure the mesh. A wooden section is attached to the top, inside edge of each side. Half way along each section a long bolt is inserted from the bottom to the top of the section. The screw thread protrudes upwards out of the section for the roof to be located and secured onto. This wooden section is protected (from being gnawed) by	being covered in an aluminium L section. The lengths of these items has to be carefully measured so that they meet snugly in each corner without leaving large gaps when the house is bolted together. The floor is made of a single piece of 6mm ply. 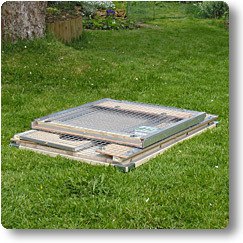 It is held in place by the aluminium U sections which form a channel around the bottom inside edge of the house. To make sure the floor fits as snugly as possible into the channel recesses are cut in the edge of the floor to corrispond to the position of the bolt heads which bolt	the aluminium U section to the sides. The final part, the shelf, is made from a single piece of 6mm ply edged with aluminium U sections. Short bolts are encapsulated in the aluminium U sections so their threads protrude outwards from the edges. Two of these encapsulted bolts are located on the long side and one each on the short sides. These encapsulated	bolts are used to bolt the shelf to the sides of the house through the	mesh or holes in the perspex. A whole, large	enough	to	take the rat’s	potty is cut in the shelf. To assemble the travel house I start with one of the short sides then slot the two long sides into it. The floor is then slid into place and the second short end is located onto the two sides and the floor. The four corner posts are secured with eight of the wing-nuts and bolts. The slelf is put into place and secured with four more wing-nuts. Finally the roof locates on the four protruding	bolts	and is bolted down with the last four wing-nuts.